Just in time for the new year, Center City Philadelphia is right on track to end 2015 with a record hotel occupancy. Center City Philadelphia’s hotel occupancy is estimated to hit a record 77.4 percent in up from 75.5 percent in 2014. Visitors to Philadelphia from all segments (leisure, group, business) will have filled a projected 3.1 million rooms—another record. In the hospitality and events sector, clients expect more than a boring, blank space. 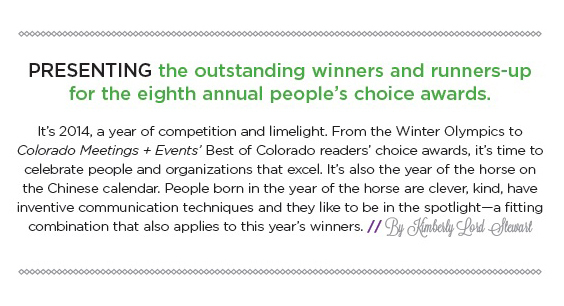 Luckily in Colorado there is no shortage of places that light a creative spark for memorable events. From properties with tales of the Old West to venues that bring out the kid in all of us, we are indeed lucky to call Colorado our work and home playground. Read more about Meet the 2014 Winners!